This class represents the concept of an instantiation of member function template or a member function of an instantiation of a template class. Definition at line 190191 of file Cxx_Grammar.h. This is an access function for the p_associatedClassDeclaration data member. Support for C++ covariant return types (used in virtual function overloading). This function generates the qualified name prefix to be used with the return type. 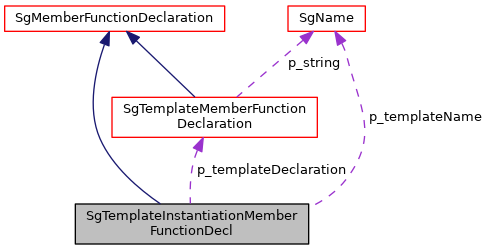 This is the template declarations (SgTemplateDeclaration) from which this template instantiation is constructed. This can be NULL, as I recall, for nested classes. This bool value is set to false at construction and later reset to true within post-processing as each instantiated template name is reset from EDG names (e.g. "A____L42") to ROSE generated names (e.g. "A<int>"). Either names would work as well for some purposes, but for source to source translation purposes we wanted the original names to be used (also avoids/simplifies linking issues using generated code with non-generated code). This is the constructor preinitialization list (used only for the constructor definitions). There are a lot of things to delete, but nothing is deleted in this destructor. Returns name of instantiated function template, name includes template arguments. sets name of instantiated function template, name includes template arguments. Returns pointer to SgTemplateDeclaration from which instantiation is generated. Returns pointer to STL list of pointers to SgTemplateArgument objects. Cast function (from derived class to SgTemplateInstantiationMemberFunctionDecl pointer). This functions returns a SgTemplateInstantiationMemberFunctionDecl pointer for any input of a pointer to an object derived from a SgTemplateInstantiationMemberFunctionDecl. Returns valid pointer to SgTemplateInstantiationMemberFunctionDecl if input is derived from a SgLocatedNode. This is a pointer to a list of pointers to SgTemplateArgument objects (used with the SgTemplateDeclaration to construct this instantiation). The template arguments are used to generate the full template name recorded in p_templateName. All arguments are saved into the argument list, but not all arguments are output in the generated code (see SgTemplateArgument for details). Template arguments are found in the instantiations, and template parameters are found in the SgTemplateDeclaration (arguments are not the same a parameters, same as for descriptions for functions). Definition at line 190685 of file Cxx_Grammar.h.